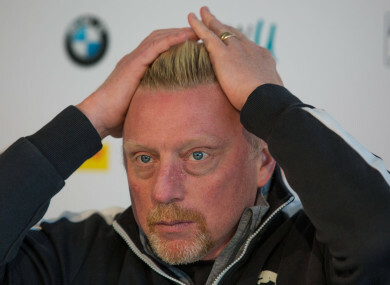 THE CENTRAL AFRICAN Republic (CAR) said today that a diplomatic passport tennis star Boris Becker claims entitles him to immunity in bankruptcy proceedings in Britain “is a fake”. “The diplomatic passport that he has is a fake,” foreign ministry chief of staff Cherubin Mologbama told AFP. In addition, the passport, a copy of which has been seen by AFP, and bears the date of 19 March 2018 does not carry the signature or the stamp of the foreign minister, Charles Armel Doubane, Mologbama said. On Friday, lawyers for Germany’s three-time Wimbledon champion lodged a claim in the High Court in Britain saying that he had been appointed a sports attaché for the CAR to the European Union (EU) in April. “Becker’s job profile does not exist” in the CAR’s records, Mologbama said. Furthermore, the passport says that Becker’s diplomatic function is “financial charge de mission”, a role that “has nothing to do with sporting questions,” he noted. The German went on to enjoy a glittering career and amassed more than €21 million in prize money. The CAR is one of the poorest countries in the world, ranking at the very bottom of the 188 nations in the UN Development Programme’s 2016 Human Development Index. Presidents have traditionally been surrounded by “sleazy courtesans” and “dodgy counsellors who talk loud,” French writer Jean-Pierre Tuquoi wrote in a book published last year. One of his successors, Francois Bozize, was named in a lawsuit filed in France in 2015 by the CAR government, which said that during his tenure, “numerous advisors and relatives… benefitted from passports of convenience” in exchange for money. These including a Kazakh opposition figure, Mukhtar Abiazov, a female advisor to former Libyan dictator Moamer Kadhafi, and an Israeli businessman, according to the suit filed by the CAR’s attorney, William Bourdon. Email “Boris Becker's diplomatic passport is 'fake' says Central Africa Republic”. Feedback on “Boris Becker's diplomatic passport is 'fake' says Central Africa Republic”.